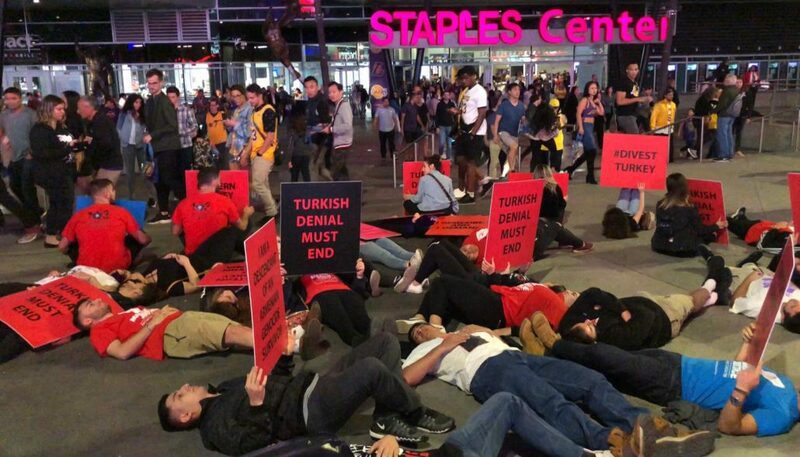 LOS ANGELES—After the 113 to 109 Los Angeles Lakers victory over the Utah Jazz on April 7, fans exited the Staples Center to find a group of Armenian Youth Federation activists staging a “die-in” demonstration to raise awareness of the Armenian Genocide. AYF members were silently sitting or lying on the ground just outside the Staples Center as thousands of attendees witnessed and held signs that brought attention to the issue of the Armenian Genocide. “We are here to educate the community of the atrocities perpetrated by Turkey during the first genocide of the 20th century, and to inform the public that proper justice, in form of restitution and reparation, has not been restored for the Armenian people,” stated Hakop Hajibekyan, co-chairperson of the AYF’s Hye Tad Committee. Along with raising awareness, demanding restitution, and calling for reparations, the AYF has been working to advocate for the divestment of over $70 million of University of California (UC) funds from the government of Turkey. Since the movement’s inception, the Armenian National Committee of America – Western Region also began working to divest over $500 million of California State funds from the government of Turkey, to ensure that taxpayer funds are no longer used to propagate Turkey’s denialist propaganda. The movement regained momentum last week after a meeting was held within the State Assembly over the new Divestment bill, AB1320. The AYF’s next show of activism will be at the annual March for Justice, which will take place on Wednesday, April 24, 2019 at 1:00 p.m. outside the Turkish Consulate in Los Angeles (6300 Wilshire Boulevard, Los Angeles, CA 90048). The March for Justice is hosted by the Armenian Genocide Committee (AGC), which is made up of representatives of over 20 Armenian organizations and includes over 40 coalition partners that fight for justice and against the denial of the Armenian Genocide. The AGC calls on all community members to unite in show of solidarity and collective strength at the 2019 March for Justice. Founded in 1933 with organizational structures in over 17 regions around the world and a legacy of over eighty years of community involvement, the Armenian Youth Federation is the largest and most influential Armenian-American youth organization in the world, working to advance the social, political, educational, and cultural awareness of Armenian youth. 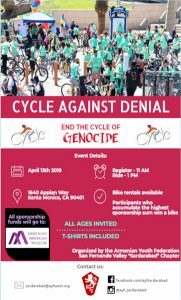 SANTA MONICA – The 10th annual “Cycle Against Denial” bike rally for genocide awareness will be held on Saturday, April 13 in Santa Monica, CA. The event will be hosted by the Armenian Youth Federation – Western United States San Fernando Valley “Sardarabad” Chapter. “Cycle Against Denial” is an annual bike rally held not only to commemorate the Armenian Genocide, but to also raise awareness for all genocides in a creative and public display. This is the fourth time the event will be held in Santa Monica. In previous years, the bike rally took place in the San Fernando Valley, with the starting point being Holy Martyrs Ferrahian High School in Encino, CA. This year, the organizers have allowed donations to be made in the name of bike rally participants, where proceeds will go toward the Armenian-American Museum. The Museum will be built in Glendale, and will include a permanent exhibition on the topic of the Armenian-American experience. This will include the history of Armenia, the Armenian Genocide, and Armenians living in the United States. “Cycle Against Denial is a community-wide event meant to bring attention to the atrocities that were committed against the Armenian people and the genocides that have followed since,” said Harut Minasyan, a member of the organizing committee. “Riders of all ages gather in the form of a peaceful protest to inform the public of the events that occurred and to make sure that the victims that paid the ultimate price will not be forgotten. The goal of the bike rally is to demand accountability for the injustice and to highlight that such crimes against humanity will not be tolerated,” added Minasyan. Following their registration for the “Cycle Against Denial” bike rally, participants are encouraged to ask friends, family and other potential supporters for donations. Donations can be made under the name of the participant, on the AYF-WUS website. The participant with the largest amount of donations will win a complimentary bike. Individuals interested in participating in the rally can register on the website beforehand. If unable to register online, participants may register on the day of the rally. In-person registration begins at 11a.m, while the ride itself is scheduled to begin at 1p.m. Registration cost is $10 per person, which includes both participation and a commemorative t-shirt. Instructions and context for the event will be delivered by the event organizers before the cycling begins. The registration table and start of the rally will be located at 1640 Appian Way, Santa Monica, California 90401, on the southern side of the Santa Monica Pier. Breeze BikeShare: Santa Monica City-hosted bike share, located at Palisades Park. For any questions, please feel free to email sardarabad@ayfwest.org, or visit the Facebook event page. 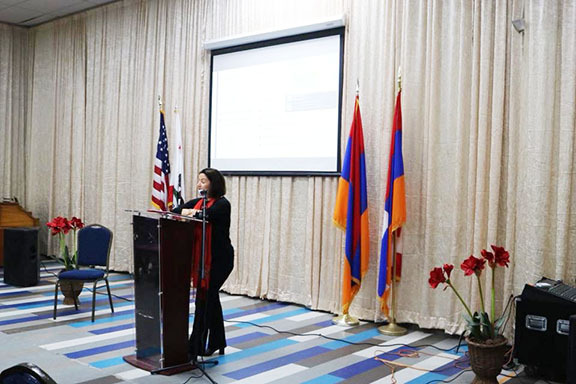 The Armenian-American Museum and Cultural Center of California is a developing project in Glendale, CA with a mission to promote understanding and appreciation of America’s ethnic and cultural diversity by sharing the Armenian-American experience. The Museum will serve as a cultural campus that enriches the community, educates the public on the Armenia- American story, and empowers individuals to embrace cultural diversity and speak out against prejudice. Founded in 1933, the Armenian Youth Federation is the largest and most influential Armenian-American youth organization in the world, working to advance the social, political, educational and cultural awareness of Armenian youth. BURBANK—In celebration of Women’s History Month, the United Human Rights Council, a committee of the Armenian Youth Federation – Western United States and California State University, Northridge’s Alpha Gamma Alpha co-hosted “Armenian Women: Breaking Barriers” at the Burbank Youth Center on Saturday, March 9th. The program portrayed Armenian women who have made significant contributions to Armenia and the Armenian people, and served to empower young Armenian women as community leaders and organizers. The event included presentations from three distinguished speakers. Dr. Houri Berberian, the Meghrouni Family Presidential Chair in Armenian Studies at the University of California, Irvine, began the program with introducing the lives of Armenian women during the Iranian and Ottoman empires, as well as the instrumental roles they played in the opening Armenian schools during the second half of the 19th century. Author Sona Zeitlian told stories of three female Armenian figures who played major roles in the sociopolitical realm of the Armenian nation. Zeitlian first spoke about Armenia’s ambassador to Japan during the first republic (also recognized as the first female ambassador), Diana Abkar. She also spoke of Hripsime (Lola) Sassouni, who organized women’s groups for defense and relief work and committed herself to raise the standard of living of refugees and orphans. Lastly, Zeitlian told the story of Siran (Seza) Zarifian, the editor/publisher of Beirut’s first women’s journal, Yeridasart Hayouhi (Young Armenian Woman), who specified the need for women in decision making bodies and involvement in community social, political, and educational organizations. Once the band concluded with their final piece, the program’s last speaker was invited to the stage. 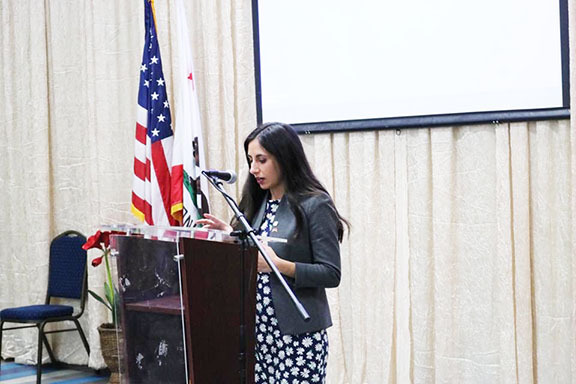 State Representative Mari Manoogian of the Michigan House of Representatives spoke about her path towards a career in politics, highlighting the challenges she faced as an Armenian democratic running for a position typically filled by republican candidates, and encouraged the need for young Armenians to become civically engaged and take part in the political process. The United Human Rights Council (UHRC) is a committee of the Armenian Youth Federation – Western United States (AYF-WUS). By means of action on a grassroots level, the UHRC works towards exposing and correcting human rights violations of governments worldwide, and aims to foster dialogue and collaboration between peoples who share this common vision.